Hey internet hounds, do you know of a film that stars: Eric Idle, Neil Innes, Michael Palin, George Harrison, John Belushi, Dan Aykroyd and Bill Murray? Course you do. Read the title up above, and then watch this film directed by Eric Idle and Gary Weis. It was made in 1979, lasting for a whole 75 minutes. FAB! 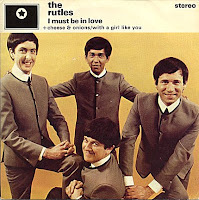 Meet the Rutles! Huh? 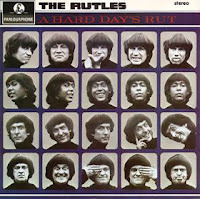 What’s do mean that you don't know who the Rutles are? They're the pre-fab four, comprising of Ron Nasty (Neil Innes), the nasty one – Dirk McQuickly (Eric Idle), the silly one – Barry Womble (John Halsey), the loud one – and Stig O’Hara (Ricky Fataar), the quiet one. Want to know more? Then follow the narrator (Eric again), in this mock-documentary chronicling the rise and fall of this sixties pop quartet. Now to aide him in this Utopian task, the narrator interviews many a scholar in the field, all of which bestow onto him scandalous insights into what happened, why it happened, and where it happened. For example, there is Mick Jagger (Big Lips), Neil Simon (Small Head), Eric Manchester (Michael Palin), Brian Thigh (Dan Aykroyd), and many-many more I can not be bothered to mention. Also, to enhance the viewing pleasure for no one in particular, there are many a video insert and pop promo which lavishes the screen with its own ornate brand of ka-ka. THE RISE: The Rutles story begins in Liverpool, when a fledgling pop group of no fixed ability, is kicked into touch by a chemist from Bolton called Leggy Mountbatten. Well, for no apparent reason what so ever, Leggy took this group, ironed out the seams of their trousers, and then flaunted their hemlines for the whole world to see. And did the world like it? Of course they did silly! Thus propelling them into the media spotlight like a Cheese and Onion sandwich, tantalizing whoever that heard them to quickly take a bite, CHOMP! 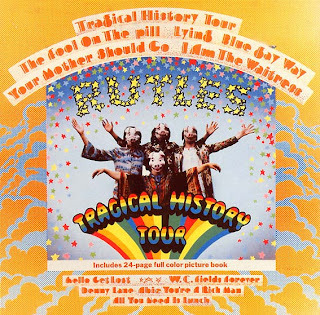 America – Germany – Rio – Ipswich, wherever the Rutles played, they set the stage on fire like a monkey with a flamethrower. Thankfully, this arena gave them the firm grounding (pun intended) to develop their craft, as well as their hairstyles. THE FALL: Regrettably, after the Rutles stopped touring, the milk of human kindness that they poured into their tea, started to turn sour. 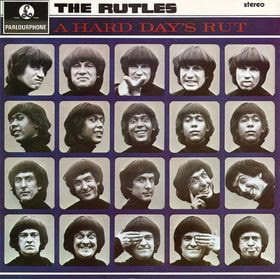 Granted, they did manage to produce some great hits, such as 'Sergeant Rutter', 'Ouch', and 'A Hard Day’s Rut', but when Leggy eventually accepted a teaching job in Australia whilst they was in Margate with the Surrey mystic, Arthur Sultan, from then on in, life turned considerably less melodic for the Rutles. The disastrous venture into self-management with Rutle Corps. The Tragical Mystery Tour. Plus the law-suit to boots. All of these gambits hammered into place so many nail's in the Rutles coffin, they all then decided to get married (to different women of course), before a final farewell on the rooftop of there recording studio. So where are the Rutles now? Ron has his thoughts. Dirk has a new punk group. Barry has a hairdresser's. And Stig, after an operation, has a job as a stewardess. Now if you are a fan of either, Monty Python, the Beatles, mock-documentaries. or just plain silliness for silliness sake, then 'The Rutles - All You Need Is Cash' is defiantly the film for you. From start to finish, this comedy just bombards you with the amalgamation of pop-facts, crazy Python humor, historical truths, and music-baby-music, that you want to expl... BOOOOOM! Please note, although all of the tune’s played in this film are ‘pastiches’ of old Beatles songs, in some way they don’t only satirize, but they also harmonize as well – they’re that good. Bless you Neil Innes, not just for having a very silly name, but for also managing to capture the Beatle-esque overtones of all the songs you have produced for this movie. Though, Neil isn't the only person who should be praised in this film you know, oh no, but the rest of the cast should too – supporting or otherwise. Obviously, Eric Idel is the pioneer of all this silliness, and as such, should be given a medal or something for thinking of such a great idea to begin with. Now if memory serves me correctly, Eric thought of this film when he was starring in the American television show 'Saturday Night Live'. He brought along with him this sketch that he did with Neil Innes – someone he worked with after being in Python – which took the form of a Beatles parody. And then, because this skit did so well, Lorne Michaels – the producer of Saturday Night Live – encouraged Eric and Neil to make this movie. Bless you too Lorne, as well as for also having a very silly name, you have helped create one of the most memorably mock-documentaries ever made (next to 'Spinal Tap' of course). Hey, here's some more trivia from the film: (1) According to Idle, he stumbled upon the name 'Rutland' when fellow python, John Cleese, told him about this very small county in England. (2) Ricky Fataars character, Stig O'Hara, does not say anything in this film, because he is the quiet one. (3) The Bernard Bresslaw song used in this movie, 'You Need Feet', went to the top of the charts in 1958. (4) Neil Innes had a small cameo in the Beatles film 'Magical Mystery Tour'. 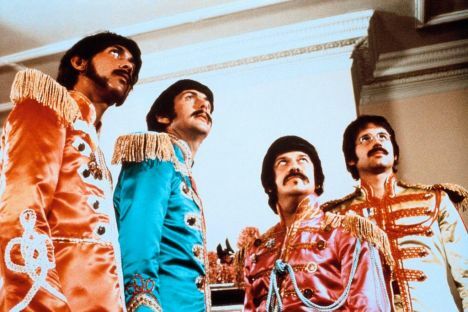 (5) During a some of the 'celebrity interviews' in this film, some of the musicians actually told the truth about the Beatles by mistake, forgetting that they should be speaking about the Rutles instead [i.e. Mick Jagger]. (6) The gliders that flew past the actors in the 'Magical Mystery Tour' spoof was not planned. (7) Eric Idles first on screen kiss was on this flick, with Bianca Jagger. (8) In various degrees, all of the Beatles endorsed this film one way or another - especially George - because he was in it. (9) Terry Gilliam called Innes the seventh Python, and he successfully sued the British rock band, Oasis, for plagiarizing his Python song "How Sweet To Be An Idiot". 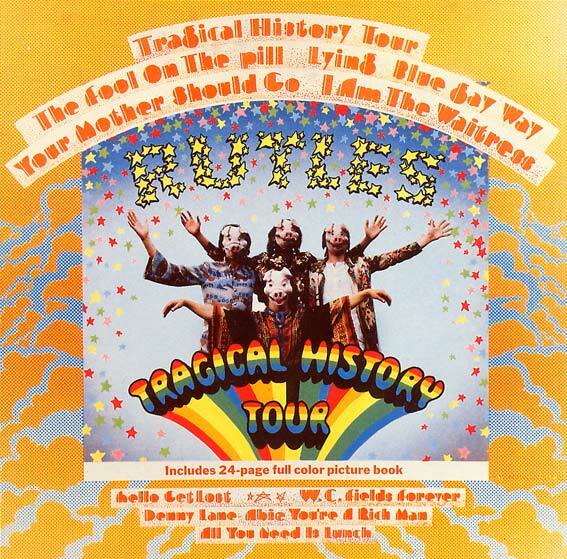 (10) 'The Rutles' was first devised in a sketch for Eric Idle's television show 'Rutland Weekend Television'. (11) In 1996, Innes, Fataar, and Halsey regrouped to record 'Archaeology', which was a satire based on the Beatles 'Anthology'. Idle did not take part, because it was explained that he quit the music business to become a comedian, ha! And (12) Idle was inspired to make this movie, after George Harrison shown him a rough cut of the Beatles documentary 'A Long and Winding Road' [which eventually became 'Anthology']. Listen, I cannot really say anything bad about 'The Rutles' at all, because to me it is that good. Well, except that it is too short? But apart from that, this is a must have for any Beatles or Pythons fans. Heck, even the Beatles endorsed this film, so you cannot get any higher praise than that, can you guys?